Olympic gold medallist Lori Fung is coming to PG, and will be delivering an intensive workshop tailored to a small group of climbers at the OVERhang. Lori will help us understand how to stretch and train our muscles, how to protect our joints, and how to get the most out of our bodies. Yes, you'll likely be sore by the time the hour is up... so start with little stretches now! 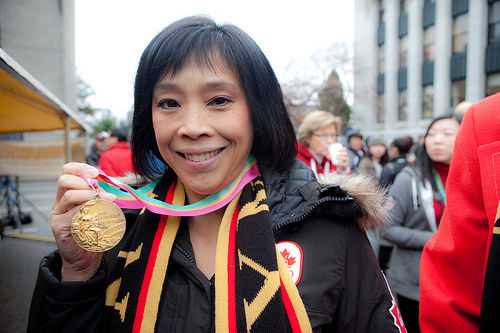 Lori Fung is from Vancouver, and was the first ever gold medalist in the sport of Rhythmic Gymnastics in 1984. She has been a coach for the Canadian National Team, U.S.A. National Team, and Mexican National Team. Lori is a member of the Order of Canada and was inducted into the Canadian Sports Hall of Fame. Interestingly, she was also cast as an aerial ballerina in "Catwoman"! Register in advance by emailing info@overhang.ca.